“I used to take them to weddings and always on the way home, if it was up this part of the world, you called in for the last drink in the pub,” she said. “I only ever remember him sitting in that particular seat. “He was blasted; they just pumped the bullets into him. Clare and Adrian ‘Frosty’ Rogan had returned from a Spanish holiday earlier that day. “I arrived at the pub just a few minutes after it had happened and a neighbour was going in as I approached. “He came back out and said ‘don’t be going in, there’s been a shooting’. “In my mind I thought that somebody had been out shooting rabbits and a gun had went off accidentally. “I had absolutely no idea what was awaiting when I went in. “When I went in, or at least I tried to go in, I’ll never forget what I saw. “Aidan O’Toole was one of the first people I met and he just said ‘we need help, we need to get an ambulance, we need a clergyman’. “I came out and Frosty was lying over the counter,” he said. “Barney and the others were piled up down below the bar. “Frosty was lying down on the ground over the counter. “Barney, Patsy and Eamon were lying piled up on top of each other. “I lifted his anorak and put it under his head. “I asked him if he was all right. “He said he wasn’t too bad. “I stayed with my son until someone put their hand on my shoulder. “Our Protestant neighbours were devastated as much as we were. “Nothing like that had ever happened,” she said. “We were told no stone would be left unturned; police told us ‘we’ll bring these people to justice, we’re doing all we can’,” said Clare Rogan. “At one stage we were told, ‘you will hear very shortly, somebody’s going to be in court before long’. “The more we learnt, the more horrific it got,” recalled Moira Casement. “We realised that there was collusion, cover ups. “We didn’t know how to deal with this. “This was foreign to our nature, to have to drag information out. “Within six weeks of the atrocity all the significant exhibits had been retrieved intact, not burnt out. “It seemed inevitable that there would be a breakthrough in terms of charges and prosecutions. “ I cannot conceive of any police policy that would reconcile it with destroying the most significant exhibit in a mass murder investigation within two years of the atrocity when the families were being told that the investigation was live. “Because of the necessity for public confidence in the army and police, the definition of collusion must be reasonably broad when it is applied to actions of these agencies. 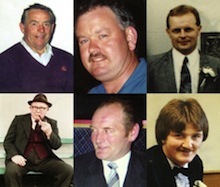 In 2009 witness ‘A’ approached the Loughinisland families with new information and agreed to co-operate with the Police Ombudsman’s investigation. “I was completely gob smacked. “They had discovered that this policeman had the vehicle that was allegedly involved, stored in their yard, even though we had been told it was destroyed. “I was completely gob smacked, I was seeing stars. “I could hardly take it in, disbelief. “Up to now we had been told that there was no evidence, there was nothing, no witnesses. “We were told there were a lot of witnesses, but nobody had given any concrete evidence of who they were or what they looked like or anything else. “But then we discovered this person had made a statement very shortly after it, a very detailed explanation of what the person, the driver looked like. In the first instance a self-confessed informer, codenamed the ‘Mechanic’, admitted that he had possession of the getaway car in the days before the killing. “It only made us more convinced that there were dirty dealings,” she said. “In my heart I would like to be able to say that I expect to find out the truth, but we have been let down so often that I don’t think that’s going to happen,” said Clare Rogan. “So many times before we have been told, you know, we are doing our best, but every time we ask a question or we go so far, another door’s closed in our face. “It’ll shed light on some things. “I think the ombudsman’s hands are tied to what they can possibly say.